Since the development of many web applications is mostly based on the Spring framework for dependency injection and application configuration in general, it's especially important to get these two frameworks running together smoothly not only when deployed on a running server instance itself but rather during the execution of JUnit based integration tests as well. Thanks to the WicketTester API provided by the Wicket framework itself, one can easily build high-quality web applications while practicing test driven development and providing a decent set of unit and integration tests to be executed with each build. As already mentioned previously, integration and configuration of our web applications is based on a lightweight Spring container meaning that the integration of Spring's ApplicationContext and a WicketTester API is essential to get our integration tests running. In order to explain how to achieve that integration in an easy and elegant fashion in your integration test environment, we'll first take a look at a configuration of these 2 framework beauties in a runtime environment. 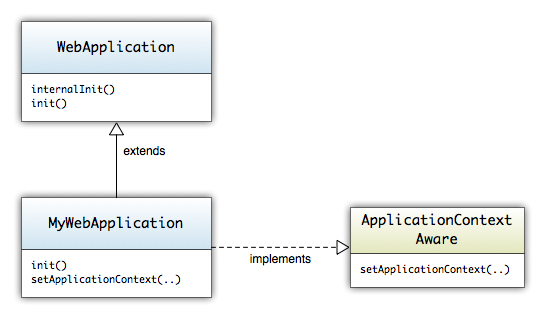 By defining three annotations on the class level (see code snippet above) in your test, Spring's TestContext framework takes care of preparing and initializing an ApplicationContext instance having all the beans defined in the according Spring context file as well as the transaction management in case your integration test includes some kind of database access. Fields marked with @Autowired annotation will be automatically dependency injected as well so that you can easily access and use these for your testing purposes. Since MyWebApplication, which extends Wicket's WebApplication type and represents the main class of our web application, is also a bean within the ApplicationContext managed by Spring, it will also be provided to us by the test framework itself and can be easily used in order to initialize a WicketTester instance later on during the execution of the test's setUp() method. With this kind of simple, annotation based test configuration we are able to run an integration test that verifies whether a LoginPage gets started and initialized, whether the rendering of the page runs smoothly and whether the page itself contains a LoginComponent that we possibly need in order to process user's login successfully. In order to use this constructor instead of the one we used previously, we now obviously need to get hold of the ApplicationContext instance on our own in our MyWebApplication implementation. The easiest way to do this is to use Spring's own concept of lifecycle callbacks provided to the beans managed by the Spring container. Since our MyWebApplication is also a bean managed by the Spring container at runtime (enabled by the classpath scanning and @Component annotation on a type level), we can declare it to implement ApplicationContextAware interface which ensures that it gets provided with the ApplicationContext instance that it runs in by the Spring container itself during startup. With the configuration outlined above, no additional modifications are required to the test itself. It's going to turn green now. This way you can use exactly the same Spring context configuration that you'd use in your runtime environment for running your JUnit based integration tests as well.